Those were the words of my boyfriend the other day as he watched me cast on my second Fawkes sock (okay, it's the third one but that's a whole other story...). We were talking about my knitting a few days previously and I had told him that there are just two stitches - knits and purls. He got me on a technicality though - casting on. He thinks he's pretty hot stuff because he knows what "turning the heel" means. Of course, he tends to ask if I'm turning the heel at random points in time now - no matter where I am in the sock. His new phrase is "closing the toe," learned while I was grafting the toe of Fawkes. He's a cute one. I'll have him knitting yet. Back in 2005, I took a trip down to Miami and the Keys with two of my guy friends. The drive is pretty long from Orlando to Miami, so I took a project with me to pass the time. My friend Jeff thought it would be hilarious to tell everyone that I was "knitting on South Beach" rather than "knitting on the way to South Beach". Took awhile to squash that rumor. Well, it finally actually happened. 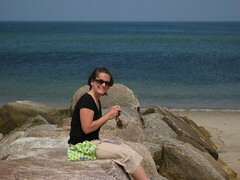 That's me on the beach on Cape Cod, knitting away on a sock for my boyfriend. We were taking one last walk on the beach before heading back to Florida. It was a great end to an amazing week away. We ran 12 miles this morning in Celebration. Wow, it got warm towards the end. Overall, it was a good run though. This is a season of vindication for me. Last December and January, I ran two fairly horrible half marathons. So, what do I decide to do? Run the Disney full marathon to avenge my past performance. I feel like I'm a woman on a mission. Really, though, I just want to finish with my group of friends and have a great weekend. I've got two Mickey and two Donald medals- this year will be a third Mickey. If I break five hours, I'll be ecstatic! I'm having relaxing time now. Well, I'm supposed to be having homework time but I'm working on some knitting and that's WAY more fun. I'm knitting my first pair of Monkey Socks which is pretty darn exciting. I'm using my first month's skein from the Yarn Pirate Booty Club. I love how they're turning out so far! The other pair I'm working on are some Thuja in sport weight. Those knit up really fast! That's basically why I'm working on two socks at once- a "work at home" pair and a "work in public, don't really need to pay attention" pair.